Professional Dog Training Results from Home or Anywhere! Are you looking for a reliable dog training device that can teach tricks, commands, obedience & control excessive barking? Do you want to bond with your dog on your own time...without paying for weeks of expensive obedience classes? 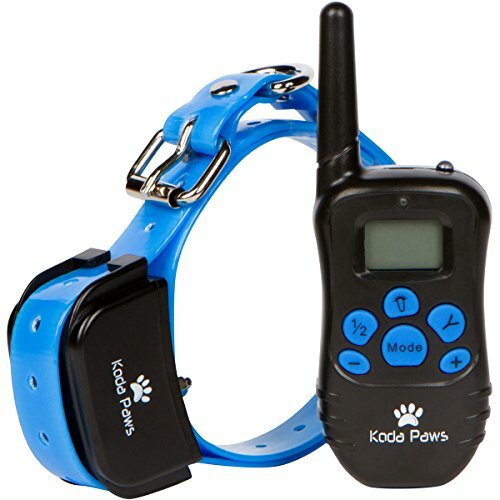 Koda Paws electronic collar & remote set is the perfect training tool for dog owners and their beloved best friends! 4 signal modes - LED light, beep, vibration & shock - let you fully customize and tailor training to your individual dog's needs. Just one collar can be used with multiple dogs! Features 100 different settings of lesser to greater signal intensity. Remote control has a range of 300m in outdoor open areas, and a bright LCD screen that's easily visible in low lighting. Collar is water resistant and rainproof so you can safely take your dog out in rainy weather or wet post-storm conditions with zero issue! Instill the obedience and companionship that your dog wants to share with you...Click ADD TO CART and order TODAY! ✅ TRAIN YOUR DOG FAST & EFFICIENTLY - The Koda Paws electric ecollar offers the best at-home behavior equipment to train a new puppy, recent rescue or your lovable old boy or girl. Use the collar to enforce discipline, teach walking & hunting commands, curb aggression & excessive barking, and achieve obedience results quickly so you can spend more time doing all the things you love with your furry best friend. ✅ VERSATILE TRAINING MODES - Our collar delivers the ultimate in professional, innovative dog training solutions with 4 versatile modes to choose from - LED light, beep, vibration & shock - and 100 different levels of intensity to assist in conditioning your dog humanely on your own terms. Some dogs respond better to audible tones, some to gentle physical stimulation and others to a subtle shock to the neck - this collar provides all of that and more! ✅ LONG RANGE FUNCTION - This advanced training system comes with a long range extended remote that lets you train in your yard or other open areas up to 300 meters. Battery life lasts for hours and comes with a USB charger for both remote and collar. Package also includes two upgraded prongs (1 long | 1 short) with silicone covers, tester and controller belt clip. ✅ WATER RESISTANT AND ADJUSTABLE - We've engineered this collar to be rainproof and water resistant so you can safely take it out on rainy days and in tall wet grass with no issues. 26 inch blue vinyl strap is adjustable and fits small to large size dogs & puppies (approximately 15 - 100lbs). ✅ 100% SATISFACTION GUARANTEE - We can't wait to add you to our long list of customers saving money on obedience classes and bonding with their dogs through personalized at-home training with their Koda Paws collar. And there's no risk to you - your purchase is covered by our 100% Guaranteed Money Back or Replacement Warranty. View More In Training Collars. If you have any questions about this product by Koda Paws, contact us by completing and submitting the form below. If you are looking for a specif part number, please include it with your message.